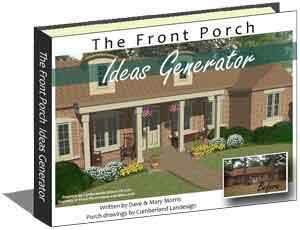 Mary and I wanted to share these fun and easy spring porch makeover projects with you. 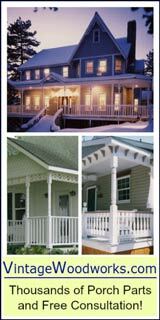 We are confident you will enjoy decorating your porch for spring; it's a wonderful time of year to start afresh! 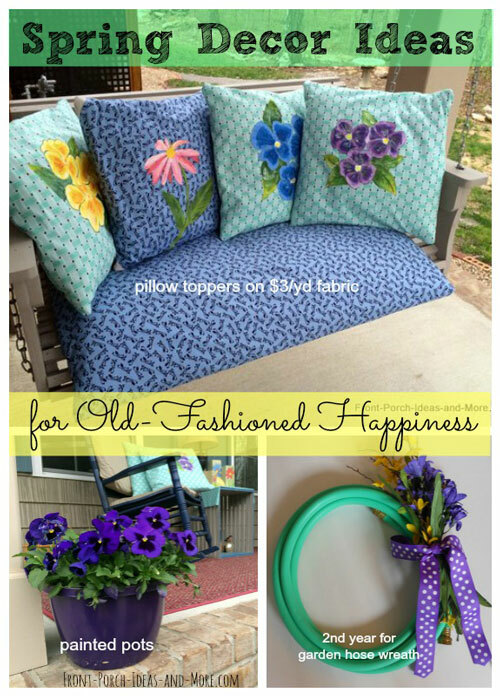 For this spring porch makeover project, learn how Rhonda, author of Ramblings of a Southern Girl (formerly Scooter Blu's Whimsy) transformed her small contemporary porch into a bright and cheerful entrance for spring. 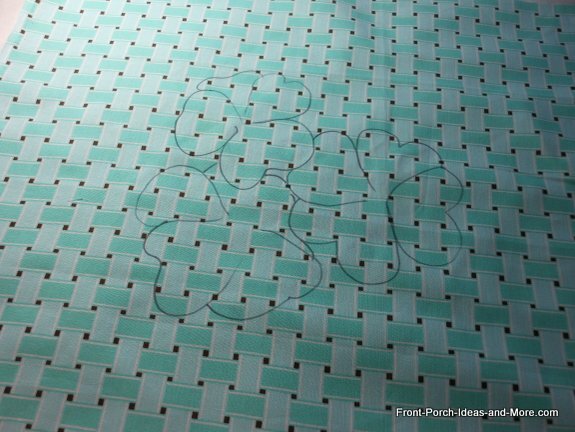 She used a no-sew method and got great results. 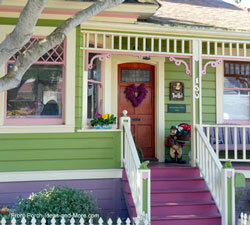 Rhonda's porch is attractive the way it was but she wanted to dress it up for spring. 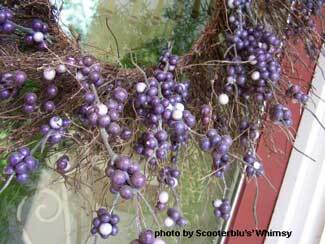 The purple berry wreaths on the front door were purchased during an after-Christmas sale at Kmart some years before. 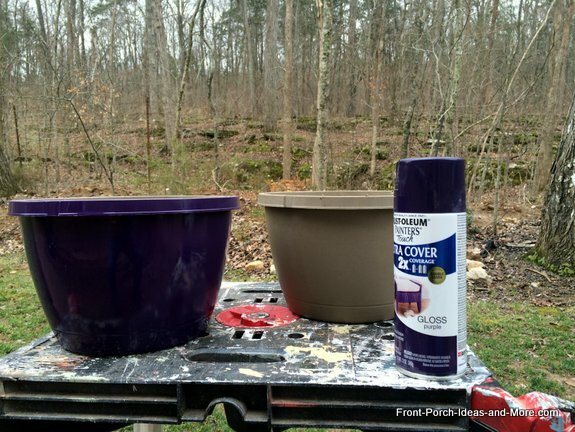 Like any good porch makeover, Rhonda removed everything from the porch, cleaned, and painted where necessary - even the pot! 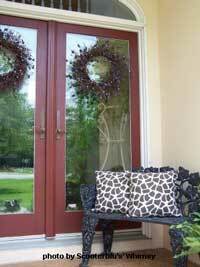 She wanted to keep the giraffe pillows to be used again and didn't want to purchase new pillow forms. 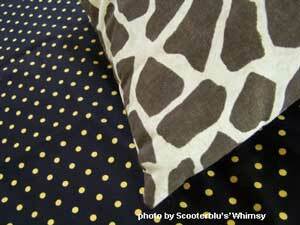 To make this possible she decided to recover them in black and yellow polka dot fabric which she could easily remove. Although Rhonda can sew she wanted an easier and faster method of making the pillow cases. So, instead of needle and thread she decided on using a glue gun. Rhonda cut the fabric to fit the pillow and with the wrong sides out, glued the seams together. After turning the fabric right side out she stuffed the pillow inside and hot-glued the remaining seam. The seam couldn't look any better or straighter, with any machine stitching. 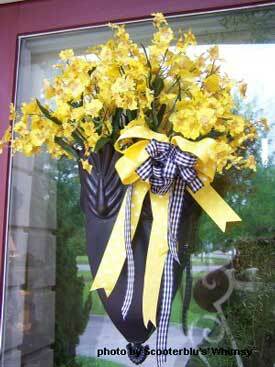 For the rest of the spring porch makeover, Rhonda found the yellow stems at Dollar Tree and filled the black planters with them. 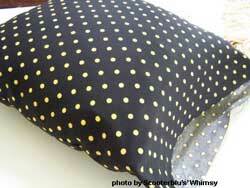 The two black and yellow polka dot pillows are complete and resting on her black iron settee, a thrifty treasure that her father bought at an auction. 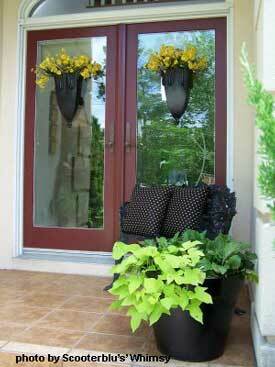 The pansies in the black pot, have been replaced with yellow Gerbera daisies and ornamental sweet potato vines. The yellow will tie in much better once the daisies fill out and start blooming. 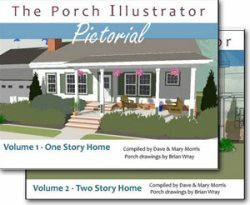 To make her spring porch makeover even more appealing she added more stems of yellow flowers along with black, yellow, and white bows to the planters. 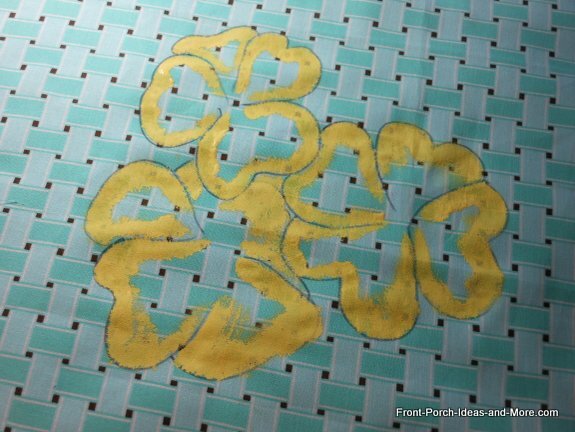 And, she plans to add a yellow pillow later...made with a glue gun, of course. 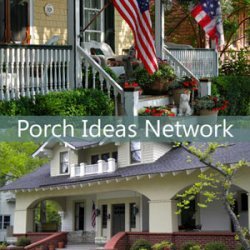 May Rhonda's porch makeover ideas inspire you to create a new look for your porch no matter the season. 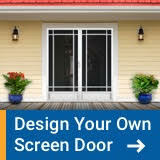 You'll add loads of curb appeal to your home. 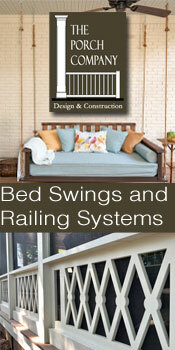 Our heartfelt thanks to Rhonda, author of Ramblings of a Southern Girl. 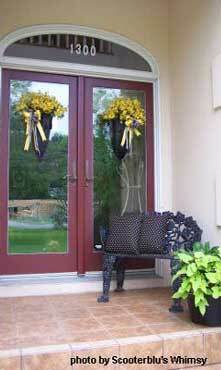 Dust your porches and brighten them with cheerful pillows and a decorated front door. 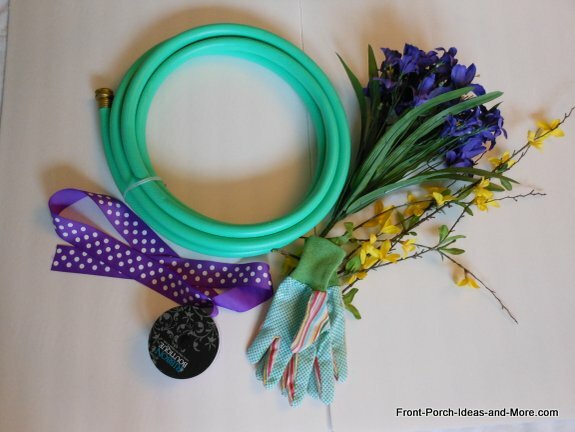 For our spring decorations we have some spring pillow toppers to show you, our garden hose wreath from last spring is all refreshed and we painted our plastic pots purple and filled then with pansies. Everything is DIY, easy and cheap. 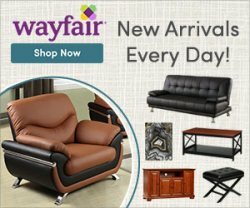 When I saw the photo of our spring decor ideas, it reminded me of times gone by. 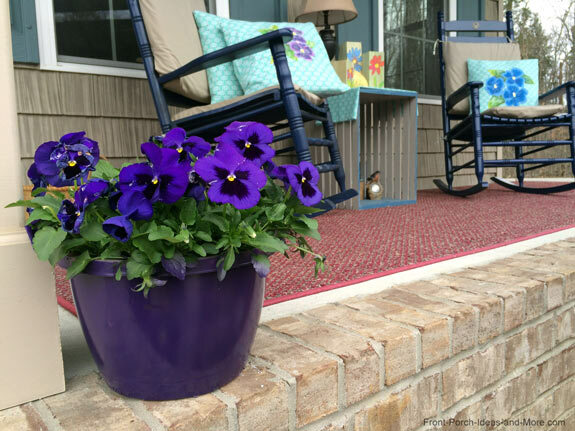 Pansy pillow toppers, garden hose wreath (updated from last year) and pansies in purple pots...we hope these DIY projects make your heart feel light, too. 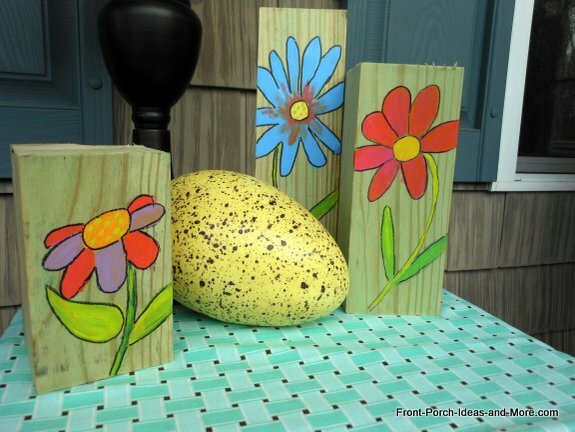 For our spring porch makeover decor, we did four pillow toppers using very inexpensive fabric ($3 per yard) and acrylic paints we already had. The pillow toppers are simply wrapped around the pillows and pinned on the back. 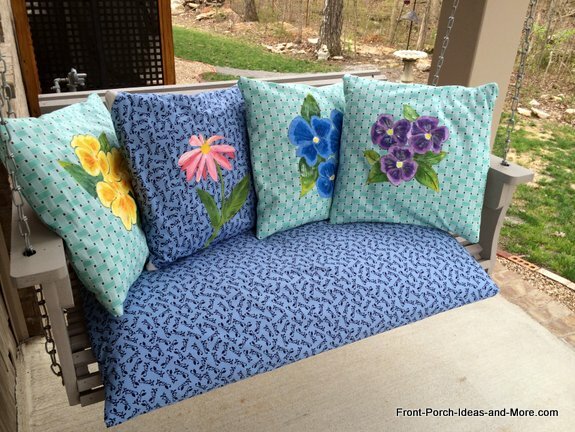 Cut the fabric to be at least a couple inches wider and longer than your pillow. 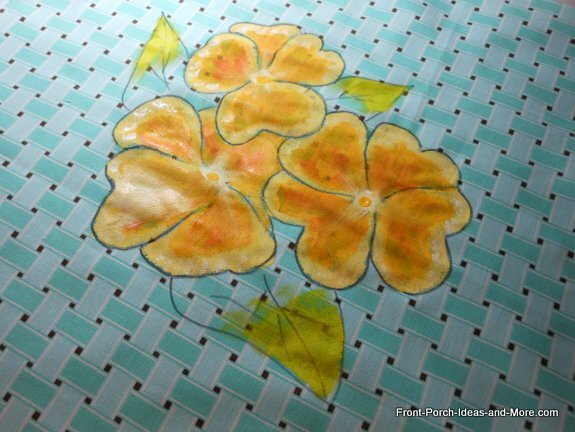 Start by sketching some pansies with a permanent marker on the fabric for the pillow topper. 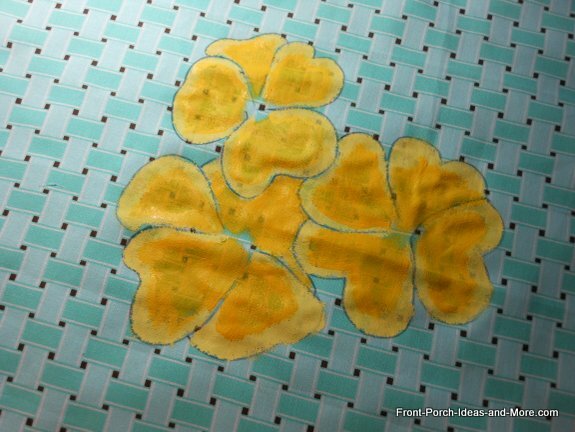 Paint the edges of the flower petals with a light yellow acrylic paint. 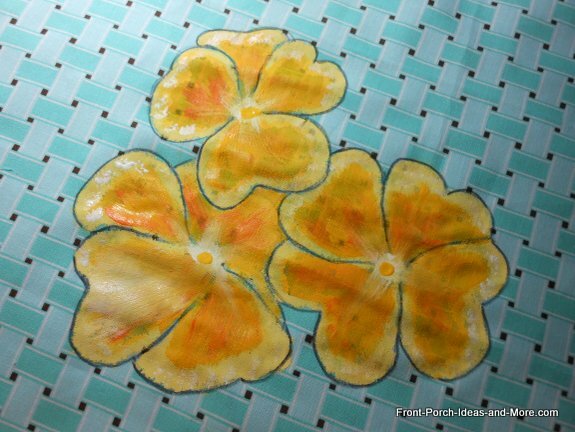 Fill in the middle of the petals with a deeper shade of yellow. Add some white to the center of the petals. Plus add in a few white highlights to the petals, if you wish. Outline a few leaves with the permanent marker and use a couple shades of green to fill in the leaves. 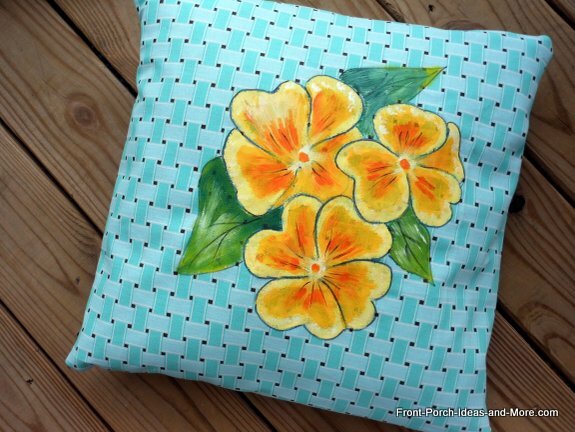 Voila, a lovely yellow pansy for our pillow topper that we simply pinned on. 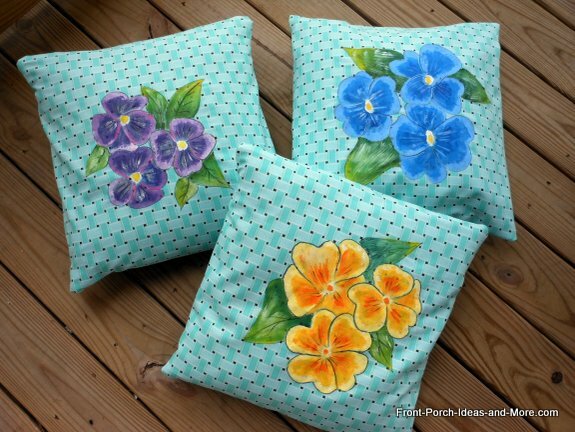 We also made blue and purple pansy pillows. 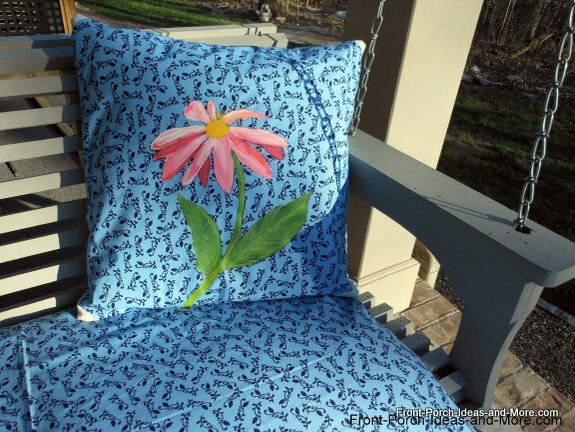 And a pink daisy for the porch swing. 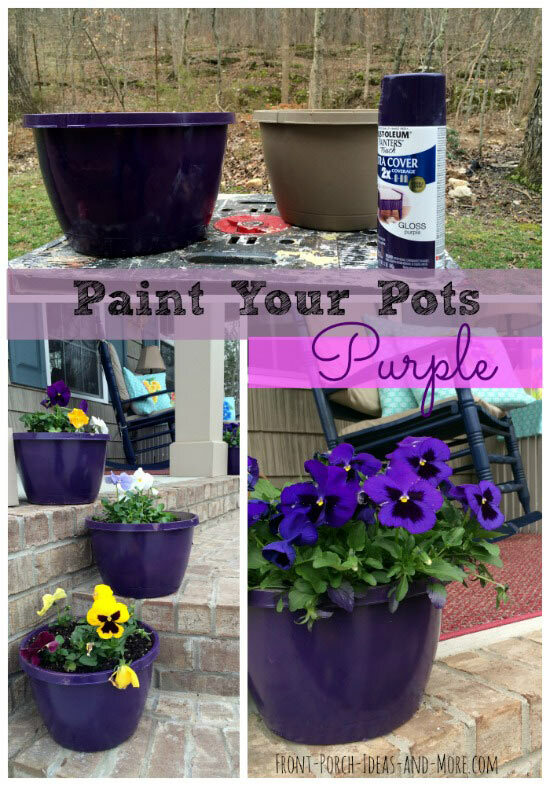 Those plain plastic pots from the garden store aren't so pretty to look at. And who wants to buy new pots? We just spray painted ours with purple paint and what an amazing and bright difference. 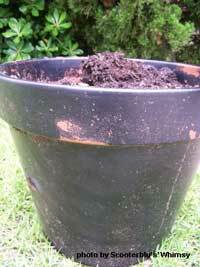 Those black plastic pots from the garden store aren't so pretty to look at. And who wants to buy new pots? We just spray painted ours with purple paint and what an amazing and bright difference. 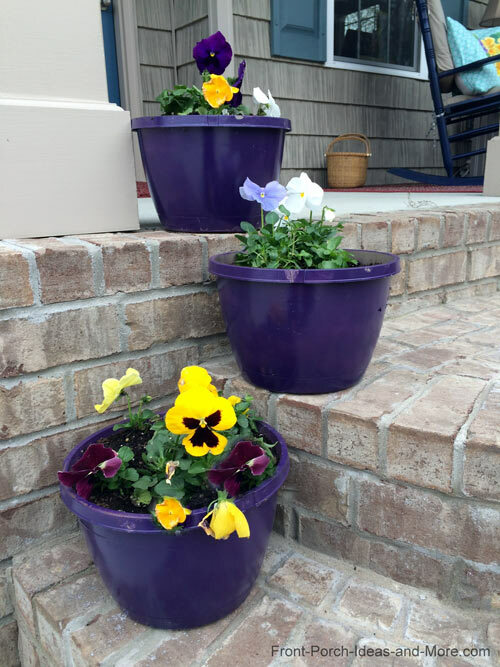 The pansies practically pop in their newly painted pots. We get compliments on these and if they only knew how easy it was to do! 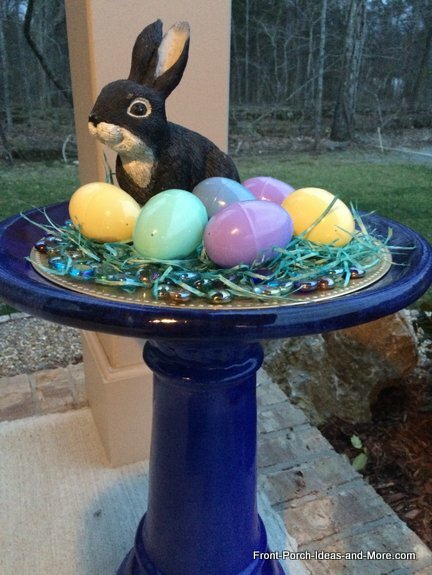 While we wished the birds loved our cobalt bird bath for splashing around, they just don't. We think they are afraid of seeing their own reflection in the water. But all is not lost. We use the bird bath in our decor. We glued the 'grass' to a dollar store plate and then added sparkly rocks on top of that. The eggs each have a few pennies in side the so they don't blow away. 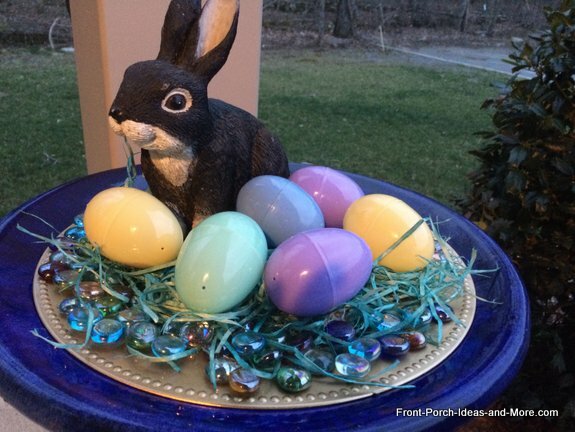 Our grandchildren enjoy looking at this Easter decoration. Dave had some scrap 4 x 4 wood that he cut into 3 pieces of varying heights. I painted a very simple flower onto each. Just simple but pretty cute on our side table. 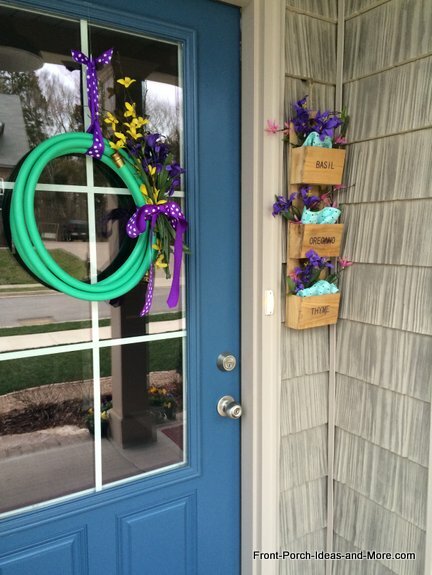 We had a garden hose wreath on our door last year, too. But to give it a new twist, we changed out the ribbon and the flowers. So easy. The garden gloves are in the pic above, but we decided to just keep it simple as you will see below. Fresh, fun and cute. 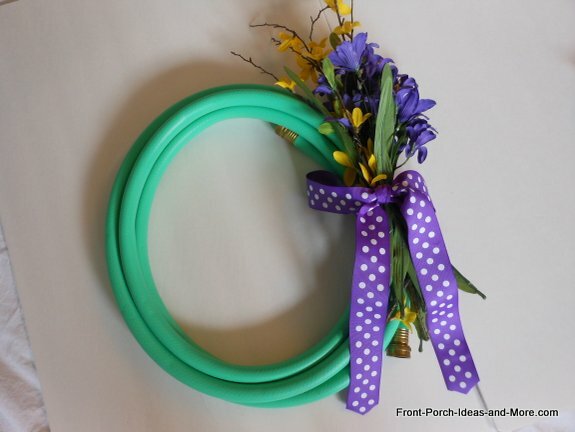 Do you like the idea of a garden hose wreath for a spring decorating idea? 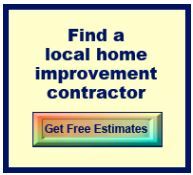 Honestly, it's so easy and affordable. 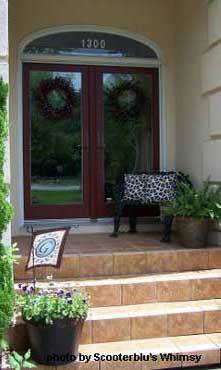 And it looks cheerful on our front door. See the herb planter to the right of it? A gift from our friends Liz and Doug, we decorate it for just about every season! 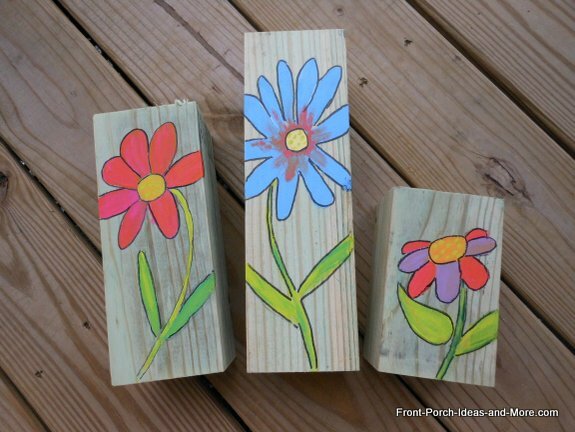 Makes for fun spring decor.